The new Mesa benches are really versatile. Combine curved benches to form circles, 1/2 circles or even "S" shapes to follow walls, trails, and so much more. There are also straight sections to add for even greaterdesign concepts. These are ideal for so many places. 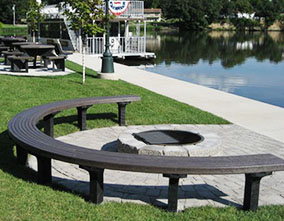 Surround a fire pit, garden, statue, fountain, or any focal point. Make an outdoor classroom, wildlife presentation area, or a very unique and welcoming memorial area. 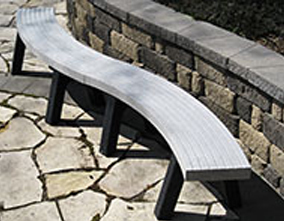 Combine straight benches and curved benches to achieve almost unlimited designs perfect for your setting. Available in surface mount or in-ground versions, these benches offer amazing opportunities for you to create something truly special. Have fun and use your imagination. Break out of the box and design your own warm, comfortable, and uncommon seating area. Curved benches benches have black legs and available seat colors are Cedar (butterscotch), Green (forest green) Gray (cement), Brown (milk chocolate). 12″ x 60″ seat. 17.5″ seat height. Four curved sections form a 10′ diameter semi-circle.